Students at Russell Jones Education Center in the Park Hill School District participated in the final BLAST: Kids on Bikes class of the season earlier this summer. Russell Jones Education Center is a K-12 school focused on teaching and empowering students with special needs and emotional disabilities, preparing them with skills to lead a successful life. 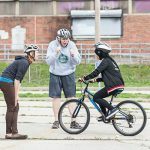 Nearly every member of the student body (or 40 students) participated in the classroom discussion portion of BLAST (Bicycle Lesson and Safety Training) and about 15 students participated in the on-bike portion of the course. Despite the heat and sun, students and even teachers were engaged and excited about learning starting and stopping techniques, signaling turns, and most of all, riding around the circle drive, practicing all they had learned. Two students also learned how to ride a bicycle for the first time. 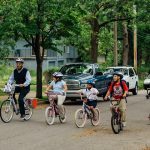 To date, BLAST: Kids on Bikes has reached almost two-dozen schools in six districts around the region. Park Hill marks the seventh school district to receive the BLAST: Kids on Bikes program. 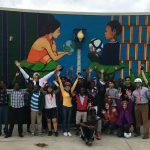 BikeWalkKC looks forward to working with Russell Jones Education Center again in the future as well as expanding the reach to other schools in the Park Hill school district.